Dynamic loads and undesired oscillations increase with higher speed of machines. At the same time, industrial safety standards require better vibration reduction. This book covers model generation, parameter identification, balancing of mechanisms, torsional and bending vibrations, vibration isolation, and the dynamic behavior of drives and machine frames as complex systems. Typical dynamic effects, such as the gyroscopic effect, damping and absorption, shocks, resonances of higher order, nonlinear and self-excited vibrations are explained using practical examples. These include manipulators, flywheels, gears, mechanisms, motors, rotors, hammers, block foundations, presses, high speed spindles, cranes, and belts. Various design features, which influence the dynamic behavior, are described. The book includes 60 exercises with detailed solutions. A new feature of this edition is the enclosed CD-ROM, which contains the SimulationX® software. 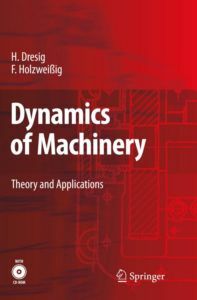 The substantial benefit of this "Dynamics of Machinery" lies in the combination of theory and practical applications and the numerous descriptive examples based on real-world data. The book addresses graduate students as well as engineers.